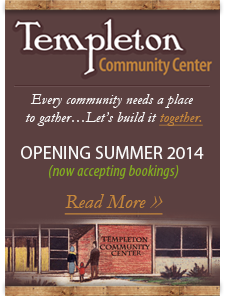 Welcome to the City of Templeton's official website. Whether you are a resident of Templeton or a visitor to our fine City, we are glad you are interested in all we have to offer. The City of Templeton has partnered with the Templeton Community Betterment Association and Templeton Area Development Corporation on this website to provide you with the information you need to enjoy all that Templeton has to offer. We are deeply proud of our heritage, colorful history, strong achievements, and potential for the future. This pride is evident in our community and we hope you will find it throughout this website as well. This site will be regularly updated and we encourage you to check back on a regular basis for the most current information on what is going on in Templeton. We also encourage you to provide feedback on the site, and if you have any questions please contact me, our City Staff, or a member of our City Council. I look forward to seeing you around our wonderful community!